A lot of time newer is not better; other times it is. We all know that we like the new gadgets and gizmos to come out on the market and some people habitually "upgrade". We all know someone who has a pile of last year's good ideas or has a small warehouse full of items on ebay that are no longer in use. Sometimes I look at a new advertised piece of gear and think; I would like to have that. I start thinking; yeah; I could really use that. Then inevitably my logical side kicks in and I ask the important questions like; do I really need this? Will this improve my life any? Can I get by with something I already own? The answer most of the time is "No you don't need this". I guess I am not a very good capitalist because I find that I do not spend very much on gear. The odd times I do though; especially if I can find something that will replace two or three things that I would normally take on a trip. Recently I bought a Leatherman Skelitool multi-tool because it reduced my canoe fix-it kit to a couple of ounces instead of a bag filled with small tools. The problem is that the society we live in says that my purchase is not enough. Shortly after releasing the Skelitool, Leatherman released the Skelitool CX with "New Carbon Fibre Handles". But what is wrong with my old one? Well the answer is; nothing. Problem is that all the cool kids that bought the new one can look at me and point, laugh, make fun of me and feel good about themselves because their multi-tool is newer then mine and they have a higher status in the tribe than me. They can point to how inferior a person I am because I don't own the latest and the greatest. The peer pressure and societal pressure can be immense. That is how our society works however and we are taught that this is the way it should be from the time we are kids. We get the Dora the Explorer lunch box which works fine and then one day some girl like Hannah Montana instead and all of a sudden Dora is not cool any more. You have to ditch that Dora lunch box or you will be ostracised by everyone. The overwhelming message in conform or be crushed. What happens though when the new stuff is just pure crap? Unfortunately better marketing wins the day. Anyone remember VCR and Beta? Not to worry though because six months down the road that crap item will be replaced too. I don't really have the money required to upgrade all the time and sometimes I get thinking that this may limit the sort of outdoor experiences that I might have. Then I remember that people have been living outdoors for a hundred thousand years; it has just been the last sixty that companies have been trying to sell me things to make my life better. Has much of what they are selling actually made life better in the outdoors? Well yes; it is hard to argue that Royalex is not better than cedar canvas canoes for beating around in the rocks. But it could be said that before plastics people just did not beat canoes around in the rocks, they lined, waded, and portaged. How fun is that? Still I do like my plastic canoes. Much of the gear that I have tried has not survived the test of time. When something is ready for the garbage I tend to disassemble it and save buckles, straps, and the useful parts for some of my make it yourself projects. I am constantly using parts of dead gear to fix up or build new gear. I save old lawn chare bags to make rescue rope bags out of, and buckles and clips all have a thousand uses. I am not contributing to that capitalist economy I know, but waste not, want not my grandmother always said. She grew up in the great depression so she probably knows a thing or two about wanting and not having. Over the years I have learned to make a lot of gear out of necessity. Not everyone can do this but if you can you are fortunate. First of all you control the quality and design and second you can sell the odd one so you can more or less support your outdoor hobbies instead of them costing you money. Another thing I learned out of necessity (from learning to make things) is how to spot quality and that is about the most important thing you can learn. If you get that down, then you can literally save yourself thousands because you will only need to buy gear once and you will pretty much be set for life. The down side is you do not get that addictive rush that comes with spending money on new things. In my experience though wanting is more powerful than having so you will probably be happier in the long run having good gear and just wanting the new junk. When it comes to canoes you are looking at a big investment. You are not likely going to get much for under a thousand dollars or pounds as the case may be. You can go lower of course but you get what you pay for. You have to decide if this is an investment you will enjoy five or ten times per year, or if this is something that you will use fifty days of the year. If you are approaching the fifty days a year in a canoe then you are well advised to consider investing a little more. When it comes to canoe build quality though newer is almost always better but you come to a plateau very quickly in canoe quality and beyond that quality plateau marketing takes over and reality is left behind. For portaging the light modern canoes cannot be beat but the cedar canvas is really no heavier than a modern plastic boat. Traditional Cedar canvas canoes are wonderful for the right person. The right person is someone who is handy and knows how to use tools and fix things but more importantly has patience. Not only the patience it takes to fix things but the patience not to beat the canoe through rocks in the first place; the sort of person who stops and gets out in the water up to his knees and never lets the canoe touch shore. The sort of person who will store and care for the canoe like it is on loan from a museum. The traditional cedar canvas is also good for the type of person who is just paddling about on lakes and canals and is not really going to beat the heck out of it. Having said that; the cedar canvas canoe is capable of being beaten around, is infinitely repairable, and even in the worst condition can usually be brought back to look like new. While it is not on par with the modern it is an old school piece of equipment that comes close in a lot of ways to modern canoes in the hands of the right person. I won't even mention aluminum and plastic paddles because we all know what they are for. When it comes to paddles a lot of people swear by carbon fibre and manmade materials. I am willing to bet they have never used their monstrously expensive paddle on a hundred kilometre plus trip with thirty or more portages through the woods where you are so exhausted that nothing has value at the end except a few minutes rest. I bet that they have never used it to dig a water trench to keep the rain puddle from forming under the tent in a storm in the dark. Chances are they have not tossed it in the back of a pickup truck to be bounced down a forty mile dirt road. They may be just the thing for sprinting across the lake but they are unrepairable on a trip, will give you blisters, and any slight damage will give you splinters or cuts. They are light as a feather and have their place but they are not the part of the average canoe user's experience. Traditional wooden paddles are in all ways superior for canoe tripping and paddling purposes period. They are repaireable, can be reasonably light, and you can generally beat the crap out of them and they only look better for it. You will not win a race with them against a determined racer with a carbon synthetic, but the racer will not follow you into the wilderness very far. Also they will need to own all sorts of accessories like paddle bags, paddle gloves, and will spend more time babying their paddle than using it. A lot of people like their modern paddles though. Well there are no old school PFD's so it is hard to make a comparison. The older style ones that came out before kayaking was popular used to come down and cover the kidneys and keep them warm. The kayaking crossover PFD's are scalloped out for the back of the seat and for the spray skirt. They are not as good but it is what most of us are stuck with. 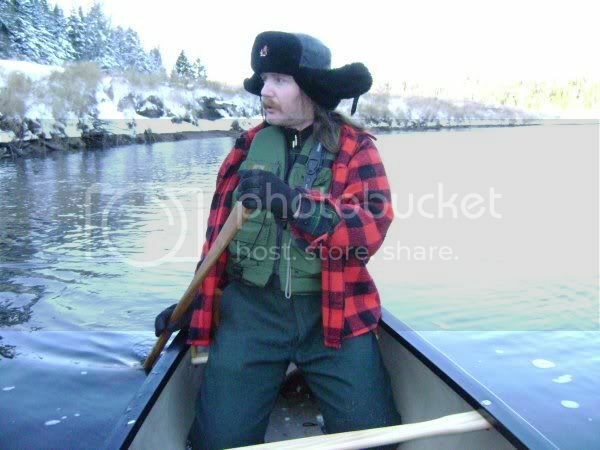 If you can find an older style canoe PFD you should hang on to it; especially if you paddle in cold weather. Well I really like the modern footwear. I got myself some military type dive boots called Amphib Boots and I really like them for the spring whitewater season and for summer on rivers with a lot of wading and lining. The problem is that they are wearing out all too fast because they are made from all synthetics. A lot of people accept this and when something wears out they just get a new one. I begin to ask; is there something that will not wear out? I picked up some LL Bean Maine Hunting boots and they come with a lifetime guarantee. If they wear out I get a new pair. They have been around for a century and are still made so they have obviously they got something right. Most people have been conditioned that they need to buy footwear every year or so, and are shocked to hear that a pair of boots will last a life time. My great granddad had LL Bean boots in the 40's and they are still as good as my new ones. Modern feet are used to a level of comfort and support that our grandparents were not used to. At one time shoes were made to fit either foot. Things have advanced considerably but it is pretty hard to find anything wrong with moose hide moccasins or Bean Boots for canoe tripping. I would have to say that some old school footwear is superior to its modern counterparts but not all. The modern stuff is in some cases a little more comfortable, lighter, and better for wading and rock hopping but it just wears out too darn fast. For me this edges the old stuff out on top by just that much. 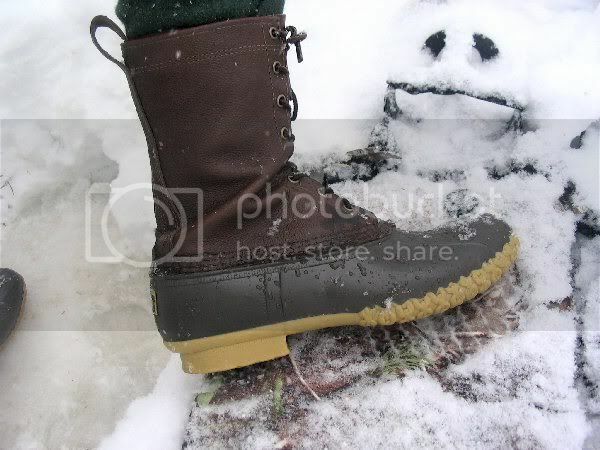 But now I have Gortex liners for my Bean boots and get the best of both worlds. I have worn out a lot of outdoor clothes. I love the modern quick dry fabrics in the summer but sometimes they do not last more than two hard trips. My old flannel and wool stuff has been with me seemingly for a lifetime. I find that a mixture of old and new is the best compromise on a canoe trip. The lighter modern stuff is good for paddling and portaging while the wools are better at night and for doing camp chores. Trips in the autumn though you can just leave the moderns stuff behind and go with the old school stuff and that certainly lightens the load a bit. My experience with some modern fabrics leads me to believe that they are excellent for other parts of the world, just not mine. It seems that Gortex stops working if it is the wrong temperature or does not work at all if it gets dirty. I am not sure what wilderness you can travel in and not get dirty? I have found that the best waterproof fabric for me is proofed canvas. It is bulky and heavy though so the modern nylon gets used instead in spite of being inferior. The lightness and packability brings it out on top. The waterproofed canvas is prone to abrasion wear though more so than untreated so in spite of how good it works, modern is just better. I am pretty partial to the modern base layer systems like the Under Armour line up. Wool long underwear is great but I like about the fast drying nature of Under armour. When combined with the old school wool outer clothes they make an unbeatable combination. While I cannot dismiss modern fabrics all together it has been my experience that they work best when combined with more traditional outer layers because of their increased durability and natural properties. Wool is not Gortex but if you are working hard your body heat will eventually drive any moisture out where it will be shed off and it still works no matter how dirty you get it. For these reasons I conclude that traditional old school clothing still have a place in today's modern world. Just forget being a fashion model for the capitalist finger pointing society if you are wearing granddads hand me downs. Canvas packs are the subject of a lot of debate. Typically there are two types of people. Most think; why do you want to carry around that old garbage? The others like the look and use it because it was recommended by Bill Mason thirty years ago. Chances are if he was still alive he would still be using it though because there are a third group of people that understand how canvas works. The secret to it is that it breaths. Don't be fooled by companies that say that they wax their canvas or treat it. It will wear out faster. Trust me on this; I have used canvas coats for horseback riding for a lot of years. A waxed canvas coat develops holes inside of 3 years from abrasion and my untreated canvas coat was made in the 1940's. Canvas packs are infinitely repareable as any tack and harness guy will tell you and if they get wet they will breathe dry with a bit of sun or wind. I would not recommend treating them with anything other than a UV protectant such as 303 Aerospace say every twenty years. They should never be put away wet though because they will start to mold. Another reason some do not like them. While you have to use dry-bags or a waterproof liner inside them they seem to be infinitely stuffable and can be abused and tossed around with little regard to their wellbeing. They can be prohibitively expensive to some though because they are a quality item in a niche market; a market which few people appreciate or understand. You may notice that the design of the average canvas pack has not changed in the last century. That is because it was perfect then and still is now. Some companies try to sew little pockets on them and add other little gimmicks but really that is just marketing however useful the minor changes are. If they increase the line from two models to ten, then they can sell a few more. Business is business. 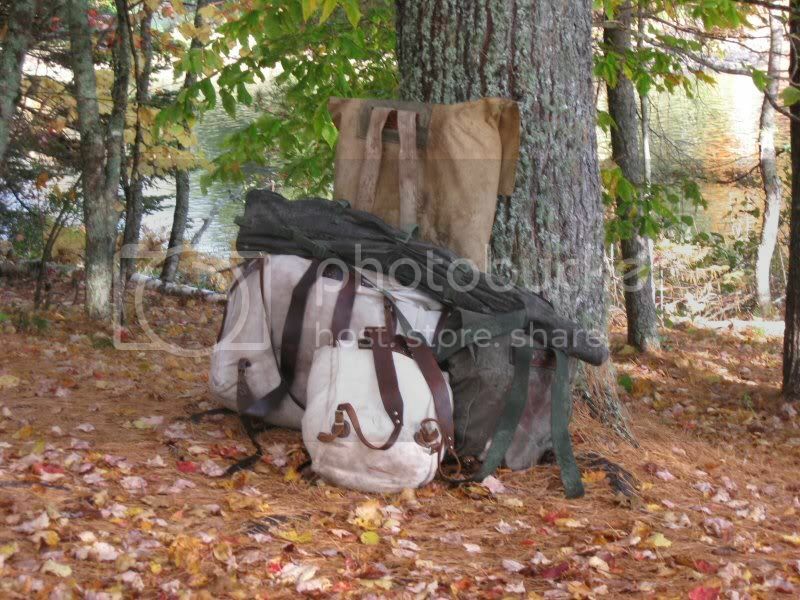 Most of the mainstream will not agree but I think old school canvas is far superior for canoe tripping than the modern gear. I have some of both and use canvas exclusively in the canoe. Like the canvas canoe you need to be able to make minor repairs (which is dead easy) and must store canvas packs totally dry to keep them serviceable. At the end of the day though when something goes wrong with a canvas pack I fix it, when something goes wrong with a modern pack I save the buckles and fabric that is salvageable and toss the rest. I hate to toss anything that I paid money for. I could go on about tents and stoves and all sorts of gear but I thought I would stick to the basics, the stuff almost everybody uses. I like a lot of modern stuff but I see the value in a lot of old school gear and cannot see it ever being retired completely to the museum. A lot of it has great value and a lot of it is superior in all ways to the modern equivalent. By using the old hand me downs you may get pointed at and laughed at by the cool kids and anyone else that is pretty materials oriented, but you know who you are and what you have. If you need to buy new canvas packs, wool shirts, and quality wooden paddles you will sure pay a lot more because you cannot get them at Walmart or Asda, but at least you will have the knowledge that you can likely pass it on for a few generations and your money is going to a craftsman and not a board of suits with a sweat shop. If you do go on any of the more arduous type of canoe trips, you can feel safe in the knowledge that you can abuse your gear like you stole it and that it will still work after abusing it for twenty years. At the end of the day it comes down to choice and some people will try to go all modern; others my try to emulate the old-timers and go all antique. Others still will choose the middle path and go with what works regardless. The problem is that it is harder and harder to find some of the old school items that work really well.